Please take a brief poll on this site! Click here to be notified when I update or add to this page! Hello and welcome to my page! 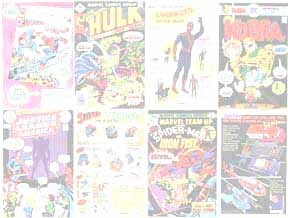 This page is devoted to displaying the covers and ads in Marvel and DC comics of the 1970s. The 1970s was a strange time for comics, an era of changing formats, price increases, and experimentation. It was also a time for great ads of cool stuff every kid wanted their parents to buy for them.... and now that we're all adults, and we have the money for this stuff, none of this stuff is being sold any more except by dealers who are getting a heck of a lot more money than the stuff originally cost! I was reminded of these while reading through some recent additions to my collection purchased for a quarter or 50 cents each, and I figured I'd start this site (besides, Tripod was getting antsy for me to do something with my space!). What you'll find when you click on the links to your left is an index of the titles or ads I have on this site. Clicking on the index links will open up a page in a new window for that title or the entry with the ad you want (unless it turns out that you're using Internet Explorer, which doesn't seem to like it... your best bet on my site is to use Netscape), with a 50% reduction image of the cover, some comments from me as to what happened in that issue, writer and artist, etc., and then one or more ads from that issue I thought would be of interest, as well as any commentary I've got on the ad. When you're finished looking at that issue and its ads, you can close the window to get back to the index of whichever title you were checking out. If you own one of the items presented in one of these ads, and you want to share your good fortune with others reading the pages on this site, take a photo of the item, preferably with you holding it, and e-mail it to me at waffyjon@execpc.com along with anything you have to say about it. I'll then add that photo and your story to this site in a special area! 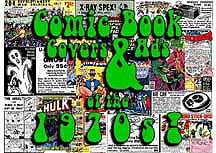 Another way you can participate here is to help me get more cool comics for this site... do you have any 1970s comics you're trying to sell (hopefully at a low price... no more than a buck, preferably 25 to 50 cents)? E-mail me at the link to the left and let me know what you have! To be honest, many of the items advertised in the 1970s comics are collectors' items today. However, there are some places on the web you can try to find them at. These are listed in the "links" section.